GWR Collett design Class 5700 0-6-0 pannier tank engine 7715 was built by Kerr Stuart & Company, California Works, Stoke-on-Trent, Staffordshire in 1930 for shunting duties. GWR tank engine 7715, somewhere in the winterish Cotswolds! Great Western Railway 5700 class. 6700-49 – 4 chains (264 ft; 80 m) (normal) and 3 1⁄2 chains (231 ft; 70 m) (slow). 9700 class – 1,230 imp gal (5,600 l; 1,480 US gal). 6700-79 were built for shunting only and were not fitted with ATC, vacuum braking, and steam heating. Although officially designated by GWR as "light goods and shunting engines", 57xx GWR 5700 Class 2 steam locomotive 7715 they were also used for passenger working on branch, suburban, and shorter mainline journeys. They were distributed across most of the GWR network and, after nationalisation of the railways in 1948, across the British Railways Western Region, and also other regions. As a result of the 1955 Modernisation Plan, the 5700 Class was withdrawn from BR service between 1956 and 1966. Nineteen withdrawn locomotives were sold to London Transport and industry, of which ten were later preserved, along with six that were retrieved from scrapyards. With the completion of grouping in 1923, GWR's collection of 0-6-0 tank locomotives was expanded with the stock from 28 acquired companies. The acquired tank locomotives came from different manufacturers, were a mixture of side, saddle and pannier, and varied widely by size and state of repair. 57xx GWR 5700 Class 17 steam locomotive 7715 57xx GWR 5700 Class 18 steam locomotive 7715 In addition, GWR's stock was wearing out, 57xx GWR 5700 Class 13 steam locomotive 7715 and the variety of classes was problematic for maintenance and rostering. 57xx GWR 5700 Class 19 steam locomotive 7715 Collett had to produce a new standard design for 0-6-0 pannier tanks. 57xx GWR 5700 Class 2 steam locomotive 7715 The result was the 5700 class. The table below gives the technical specifications of the 5700 class. Values are from GWR diagram B48 57xx GWR 5700 Class 20 steam locomotive 7715 unless referenced otherwise. The 5700s were given the GWR route colour Blue 57xx GWR 5700 Class b steam locomotive 7715 (based on axle load), and were in the GWR power group C (based on tractive effort). 57xx GWR 5700 Class 24 steam locomotive 7715 The classifications were shown on the cab with the letter C in a blue disc. The initial design also included a return to non-fluted coupling rods and laminated springs beneath the leading and driving axleboxes (both features harking back to the 1854 class). 57xx GWR 5700 Class 1 steam locomotive 7715 The locomotives were also fitted with cast iron chimneys (which had only rarely been fitted to earlier locomotives), 57xx GWR 5700 Class 1 steam locomotive 7715 and the whistles were fitted on top of the firebox rather than on top of the cab. However, the 50 locomotives of the 6700 Class, or 67xx class, were not fitted with vacuum brakes, steam heating, or ATC, and were fitted with three link couplings only; they were therefore limited to shunting duties and some freight working. 57xx GWR 5700 Class 31 steam locomotive 7715 The 6700s had a smaller minimum curve radius of 4 chains (260 ft; 80 m) (normal) and 3 1⁄2 chains (230 ft; 70 m) (slow) and an increased axle clearance. A pannier tank locomotive adapted for underground working. 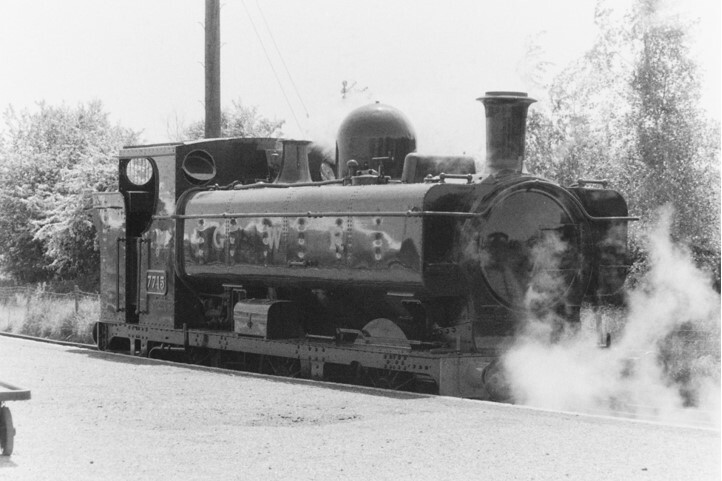 The pannier tank shown is shorter than usual, starting behind the smokebox and after about a third of its length extends down to the footplate. At the front there is a pump and extra pipe work, which also extends above the boiler. The 9700 Class, or 97xx class, pannier tanks were a direct development of the 5700 class. The prototype for the class, No. 8700 (later No. 9700), was a rebuilt 5700 locomotive. 57xx GWR 5700 Class 1 steam locomotive 7715 They were specifically for working on the Metropolitan/Hammersmith & City lines between Paddington Stations and Smithfield Meat Market. They replaced Metro and 633 class locomotives. The eleven locomotives in the class had condensing apparatus that fed the exhaust steam back into the water tanks. 57xx GWR 5700 Class 32 steam locomotive 7715 The tanks themselves were shortened to make room for the external exhaust pipes and were extended down to the footplate in front of the cab to increase their capacity. 57xx GWR 5700 Class 32 steam locomotive 7715 As condensing the steam heated the water, a reciprocating pump (Weir pump) was fitted as a boiler feedwater pump because standard injectors will not work with hot water. 57xx GWR 5700 Class 32 steam locomotive 7715 The pumps led to (unsuccessful) tests with these locomotives acting as fire engines during World War II. After a gap of a year, building started again in 1933, with the 8750 and 9700 classes, and continued until 1950. 57xx GWR 5700 Class 38 steam locomotive 7715 All the later locomotives, totalling 563, were built at Swindon, and the numbers built only dropped in the last few years with the introduction of the 9400 class in 1947. The different series started in the following chronological order; 57xx (1929), 77xx (1929), 67xx (1930), 87xx (1931), 97xx (1933), 37xx (1936), 36xx (1938), 46xx (1941), and 96xx (1945). 57xx GWR 5700 Class 53 steam locomotive 7715 GWR locomotives were not renumbered after nationalisation, but a W (for Western Region) was temporarily added to some locomotives. The 5700s' route classification (Blue) meant that they were allowed on approximately 70% of the GWR network. By 1938 only 15 57xx GWR 5700 Class h steam locomotive 7715 (out of approximately 70) running sheds did not have any 5700s allocated. At Weymouth, 5700s operated the branch line to the Isle of Portland (replacing LSWR O2 class 0-4-4T locomotives). 57xx GWR 5700 Class 65 steam locomotive 7715 They were also seen pulling boat trains through the streets of Weymouth. A pannier tank locomotive is pushing a shunter's wagon and pulling a guard's van. The locomotive is painted in a faded maroon with black and yellow piping, but much of the paint has peeled, revealing the black paint underneath. The lettering "LONDON TRANSPORT" is shown in yellow on the side of the pannier tank. A pannier tank locomotive, seen from above and to the front, is passing through hilly countryside. The locomotive, particularly at the front, is streaked with vertical stains. 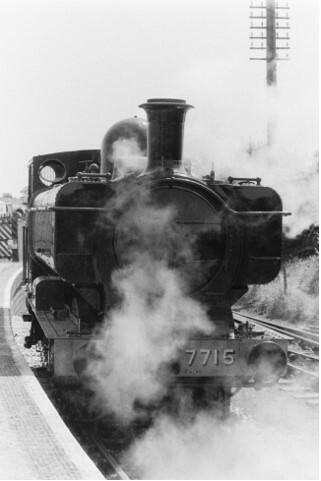 The lettering "NCB 7754" is shown on the side of the pannier tank. A pannier tank locomotive stands alone in a scrapyard next to a semi-derelict building. In the background are other locomotives waiting to be scrapped. To the left is a fence of concrete posts with wire. No. 3650 was withdrawn in 1963 and then sold to P.D. Fuels, a division of Stephenson Clarke Ltd., and was used to move spoil to slag heaps at Gwaen-Caer-Gurwen colliery near Ammanford, Carmarthenshire. 57xx GWR 5700 Class 78 steam locomotive 7715 It was later bought and restored by members of the Great Western Society and became operational in 2009. Sixteen 5700 class locomotives have been preserved, of which six are currently operational. Four of the class have worked mainline trains: 7715, 7752, 7760 and 9600. Of these 7752 and 9600 both are operational and capable of working excursion trains on Network Rail but 7715 and 7760 are currently out of service awaiting overhauls. Two locomotives are on static display, and two are in store. Six locomotives are undergoing, or waiting for, maintenance. One locomotive, No. 9629, is being restored, and has not been in steam since it was sent to Barry Scrapyard in 1965. Enter specific words e.g. locomotive, train, station, place, etc.